The origin of Aksai black pied pig is traced to Kazakhstan. Despite the name it features a very distinctive black/grey, white coloration. The entire pig is pinkish white with black patches like a Dalmatian. Bred for their meat content the animal is domesticated and ideal for commercial production. It has short coat hairs, creamy white with black uneven patches. The tail is twisted, big muzzle and stocky body. Average height for sow is 167cm while the boar grows 182cm. The sow weighs 244kg, boar 320kg. There is a huge number of purebreds in production. The animal was produced from crossbreeding Berkshire and large whites. First developed in 1952 it is breed in experimental training farms in Kazakhstan and state farms. 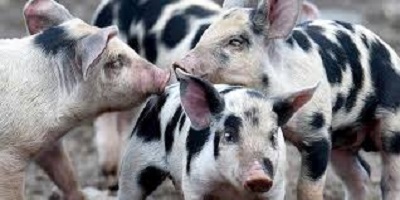 For commercial production they are crossed with large white, landrace and North Caucasian pigs. This has improved the meat quality and piglet production. Under ideal feeding conditions they attain 100kg body weight in 212 days. Carcass length 96cm, ham weight 11.2kg, fat thickness 30mm. A sow produces 8-10 piglets per litter. Favorite diet is general pig fodder. Aksai is bred for agricultural purposes and meat production. They grow rapidly and the large size supports commercial meat production. Life expectancy is long and they live 14 to 20 years.